Today is not just your ordinary Tuesday – today is September 11th. September 11, 2001 (9/11) is known as one of the saddest days in American history. Nearly everyone who was alive remembers where they were when they heard the news on that day. Now, 17 years later, the tradition of remembering this tragic day lives on. A popular way to pay tribute is to visit one of the 9/11 memorials – many of which have recently opened. Let’s take a look at a few of those memorials and how they have shaped the America that we know today. The 9/11 Memorial is the official memorial of the Twin Towers that fell on September 11, 2001. The memorial waterfalls sit in New York City at the exact location in which the towers stood. The memorial is a popular tourist attraction as it “pays tribute to the past and serves as a place of hope for the future”. In 2015 the newly opened One World Trade Center (Freedom Tower) celebrates its first 9/11 as a fully finished building. Freedom Tower is 1776 feet tall and was built right next to the 9/11 Memorial. 1776 is the year that America was born, so it is only fitting that Freedom Tower extends 1776 feet. It is the tallest building in America and the 4th tallest building in the world. Its observation deck recently opened and should be flooded with people this weekend. The tribute of light is a tradition that has been carried on sporadically over the years. The tribute involves extending two lights up from where the Twin Towers used to stand. The image above is from 2014, when the Freedom Tower was nearly completed. Both the Freedom Tower and Empire State building have been known to display red, white and blue lights on the night of September 11. The Pentagon Memorial opened in 2008 and it is a permanent outdoor memorial located right outside the Pentagon Building in Washington D.C. The memorial pays tribute to the 184 people who died during the explosion at the Pentagon on September 11, 2001. 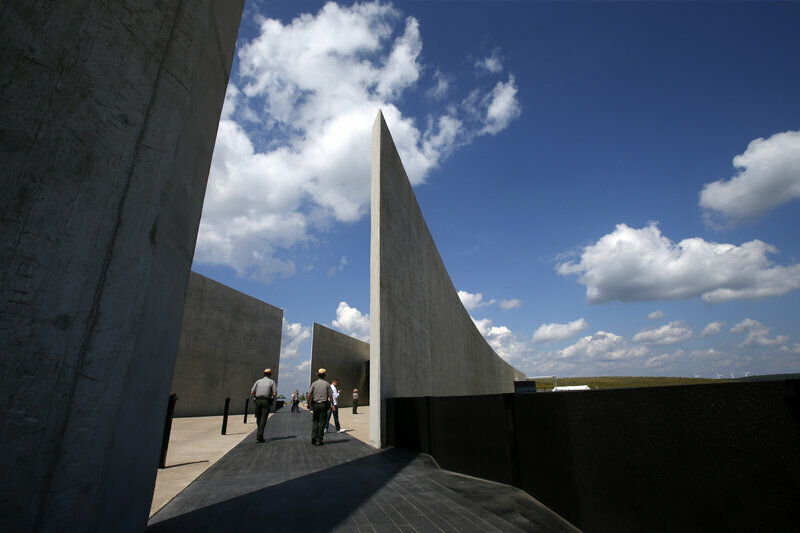 The newest 9/11 memorial is the Flight 93 Memorial in rural Pennsylvania. The Flight 93 Memorial opened yesterday, September 9th, and it pays tribute to the lives lost on a United Airlines plane that was hijacked on September 11, 2001. The hijackers were presumed to be heading towards the United States Capitol Building before crashing in a field. How will you pay tribute to the lives lost on September 11, 2001?